Click here for a sample of ANC043. The virus and the tumor are the stillborn children of three discarded words—the inspector traces these with her thumb as a sky becomes the column of shattered embers . . . Yes, it did. 1918: As the world's young men crisscrossed the globe in pursuit of some restoration of order, they carried within them the makings of further disarray. From the trenches of the Western Front to the island paradises of the Pacific, influenza spared few it touched. Five percent of the human population perished, from India to Iowa, Samoa to Sierra Leone. For a species already engaged in the war to end wars, the speed and force of the epidemic were simply too much; upward of one hundred million lives were lost in a matter of months. And yet, that rapidity combined with the psychological toll of WWI resulted in the virus' relatively minor significance in our collective history. 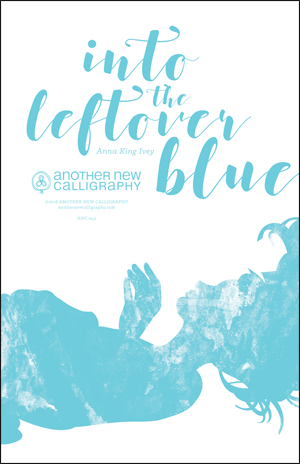 Anna King Ivey's into the leftover blue examines the legacy of this forgotten pandemic as a means of reconciling the grief of a deceased parent. Opening as a third person analysis of historical sources detailing the outbreak and its aftermath, the narrative ultimately shifts to a first person acceptance of death and its lingering ache. It reminds us time is often the only remedy for catastrophe, no matter its scale.